I could hear them out there through the fog of my sleep, the gobble, gobble sound. 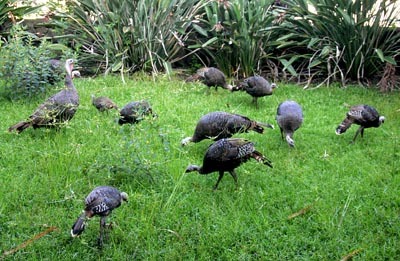 Looked out my window and spied 14 turkeys feasting away on the much too long lawn grass that has gone to seed. Lucky for them it’s far from Thanksgiving and I don’t think my shotgun would be welcomed being fired in the neighborhood. So off they went, like so many sparrows in a park, munching away, leaving when they were done.